Memcached is a distributed memory object caching system intended to speed up dynamic web applications. It provides an ideal platform for accelerating the performance of web applications in the cloud. 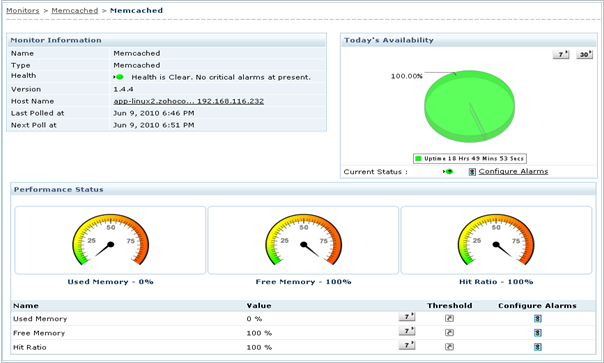 ManageEngine Applications Manager provides a comprehensive solution to proactively monitor the health and performance of business-critical Memcached servers. This allows IT administrators to identify and resolve problems with caching systems before they can have an adverse impact on the business. 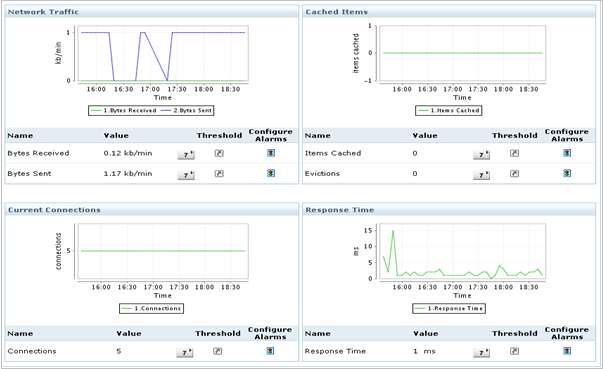 Get an overall picture of the current availability, health and cache hit ratio of the memcached server. By looking at the hit ratio, you can see the effectiveness of the memcached memory and the performance benefits it brings to data access. Avoid the problem of your memcached server running out of memory. Get notified when the memory usage is high. Check if CPUs are running at full capacity or if they are being under utilized. Keep track of metrics such as user CPU, System CPU, cached hits/min, cached misses/min, number of retrieval and storage requests per minute, etc. 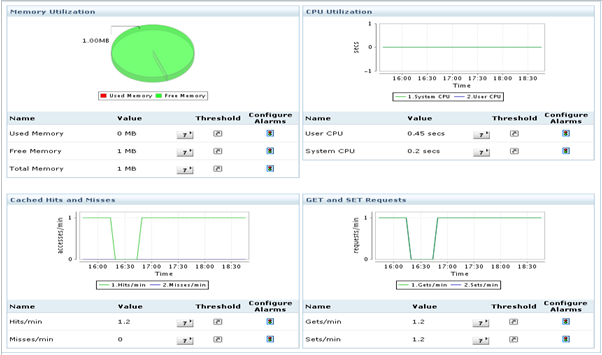 Monitor the network traffic with metrics such as Bytes received / sent per minute. Other performance metrics include Transaction details, response time, number of open connections, items cached and evictions. ManageEngine Applications Manager also provides out-of-the-box reports that help analyze the Memcached server availability and performance as well as help in capacity planning. In addition to monitoring Memcached servers, there is out-of-the-box support for monitoring databases, application servers and other Enterprise Applications making managing IT resources easier for the System Administrator.